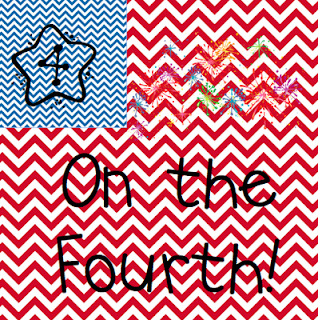 Today I am going to link up with the lovely Ms. M for her 4 on the Fourth linky party! For this party, we need to talk about four things we are going to try this year - brand new stuff! (2) I want to expand my calendar routine to incorporate some of the Teacher Tipster's ideas to make it more well-rounded and comprehensive. I also want to move my calendar routine to the afternoon since I teach math at that time! (3) I want my class to fill out their planners/assignment notebooks first thing in the morning next year. It seems like a little change but I think it will be a big difference in the day. Last year I would have them do it right before dismissal and it was a mess every day. Now I'll know that everyone has the right information and parents will know exactly what's expected of their kiddos! (4) I want to forego my weekly newsletter to parents. It was a lot of work and stressed me out every Friday! Instead, I already set up a Tumblr page for our class to update parents on spelling words and upcoming events, and I'm going to implement News Notebooks in my class. Hopefully I'll write more about that once the school year starts - if it's going well, that is! I feel that way about the upcoming school year too! All these new ideas have me jazzed! I so agree with your #2. I've gone back and forth for years on the best time to incorporate calendar. I think the kids get more out of it when it's used to start math time, but I'm so used to it being part of the morning meeting, that I always feel like I'm doing something wrong if I wait until later in the day. I would love to hear about how it works out with your class in the afternoons. PS - Your blog is amazing! I can't believe you are a second year teacher. You have definitely found your niche in the world. Those are great goals. I can't wait to hear more about your News Notebooks. Tumblr is new to me. I just email my parents now. Is Tumblr easier? I'll have to check it out. High confidence is ALWAYS a sure sign that the next year will be good. You have so much greatness going on, there is bound to be more next year! Great goals. I can't wait to see what next year brings for you. Oooh I was thinking of doing a newsletter next year but am interested in knowing more about your News notebook for sure! I too read No More I'm Done, and LOVED it! I have so many great ideas from it and can't wait to try it out. I would love to hear more about what you are going to do too since I am in second grade too! We should keep in touch :) Loved your ideas, thanks! I was looking through Mrs. Meacham. AMAZING. Thanks for the link. I am taking notes and making plans. Thanks again.